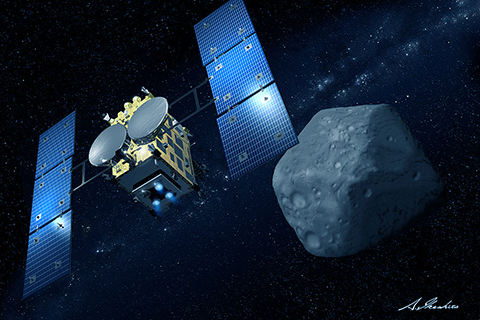 Named after a dragon king’s underwater palace in Japanese folklore, the target diamond-shaped asteroid 162173 Ryugu was visited by two small probes bounding over its low-gravity surface, deployed this weekend by the Japanese Aerospace Exploration Agency (JAXA) space mission Hayabusa2, launched nearly four years ago. The two small landers will study and survey the surface in preparation for the arrival a third joint French and German engineered unit which will drill into the surface of the asteroid and collect a sample to return to Earth for study by 2020. The castle, according to legend was sought out by fisherman Urashima Tarō on the back of a sea turtle and returns (away for much longer than he expected or perceived) to shore with a mysterious box, much like the goals of Hayabusa2.